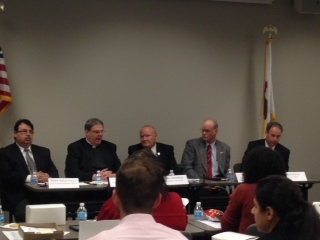 With members of Congress home for the April recess, top Illinois faith, business and law enforcement leaders met Thursday, April 24 at the Peoria Area Chamber of Commerce(100 SW Water St., Peoria) to discuss immigration and urge Congress to vote this year. The meeting identified the economic, moral and security imperatives for passing commonsense immigration reform this Congress. 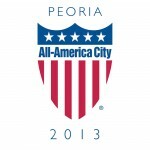 The meeting was sponsored by the Peoria Area Chamber of Commerce, U.S. Chamber of Commerce, Bibles, Badges and Business for Immigration Reform network (BBB), Bradley University, Caterpillar, Inc., FWD.us, Illinois Business Immigration Coalition, and Illinois Farm Bureau. Panelists included: Pastor Adrian Garcia, First United Methodist Church; Fr. Tony Lee, Holy Trinity and Historic St. Patrick Parishes; Brad McMillan, Bradley University; Doug Baird, The Highlands and Baird Seed Company; and Mark Peters, Caterpillar. Each panelist shared their perspective on the issue, citing the economic and moral impacts. Please click here to learn more about immigration reform. 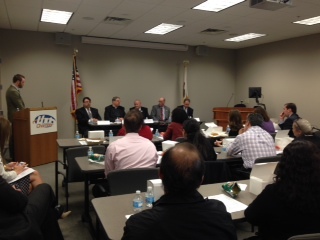 The panel encouraged everyone to contact their politician and speak with them about the need for immigration reform.